As usual, a well thought out design and implementation. I haven't finished reading the whole thing yet. For what it's worth, this is basically the same system I was installing (with commercial collectors) back in the early 80's. So I think it's a well-proven design. Even the collector design is state of the art DIY with little room for improvement that I can see. But it's just DIY, not much "market penetration" potential with a system that only one in 100 people have the ability and tools to implement. I realize market penetration has never been your intent, so my criticism is not valid. But helping lots of people save money with solar energy probably is your intent. 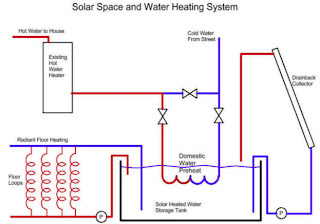 How will this "recipe for solar" help someone with, say, $6,000, but not all the tools and the time to implement your recipe? Maybe I'm not asking the right question or framing it right, but is there a "next step" to get more of these installed? 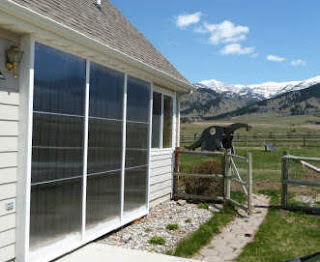 I would say that the number of DIY types is whole lot more than people tend to realize, and I think one path to some worthwhile penetration would be to get solar diy projects in front of a lot of people with good books and the like. I'd guess there are more diy decks built each year than the total number of solar hot water systems that have ever been built in the US. Its a matter of getting the knowledge out that its a straight forward job that lots can do. Well, you are certainly giving them a road map to do it. The $3k max price point is the goal I'm pursuing as well. If this system is on your roof and the exterior supply piping is well insulated, the chance of freezing is extremely low. If the supply piping is PEX, then it would be freeze tolerant in the worst case. 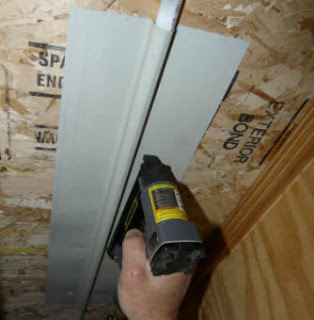 NREL has provisionally verified PEX freeze tolerance thru testing. NREL has also verified that warmth from the house can cause enough thermosyphoning in the supply and return pipe to prevent freezing. I've independently verified that in what I think was a bit more of a "real world" test. The supply and return have to be pretty short and some of the piping inside the house must be uninsulated. As you know, this type of passive system has no pump, valves, controls, or sensors to fail. I have seen these heat pipes fail when they lose their vacuum, but 80% of them probably go 20 years. I don't know the average life of the tank. 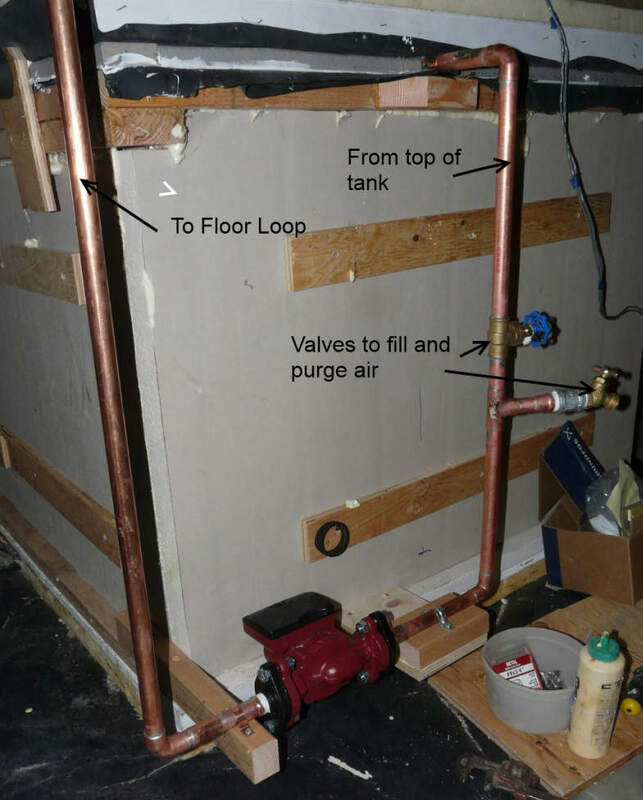 In new construction, this tank can be wired with 240V backup, thereby saving the interior space for a backup tank and the cost of it. This essentially gets your first cost down to about $2k installed. Not bad. I haven't done one yet, so I haven't yet learned the "unknown unknowns". 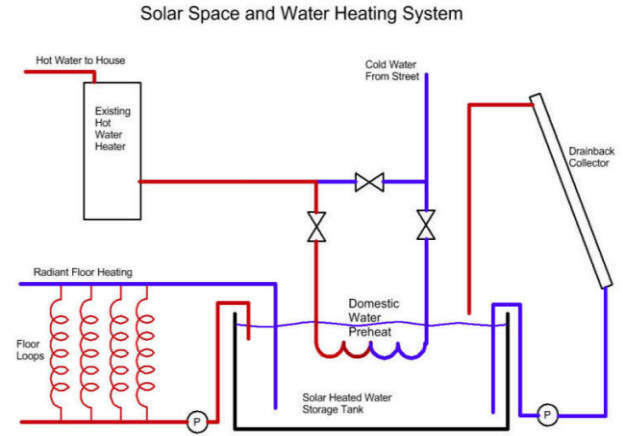 Use a conventional pressurized water heater, a Topsflo solar pump (PV powered), and one of your PEX DIY collectors. It freezes, no problem, it thaws out on the next sunny day. Freeze protection has been causing too much cost. Many people don't think twice about spending several hundred dollars to install a deck or renovate their houses by themselves. Buy a how-to book with plans one weekend and materials the next. Gary, there is enough detailed information for the professional or weekend handyman on your site to design and build anything solar. I have extensively used this site to design an entire house using solar and also to rethink it several times using different components. This is one more building strategy for people to consider as a project that can make a difference in their bills and the environment. And it is free. Thanks for a great site. As I said, I installed and commissioned about 50 similar systems in the 80's. Here are a few observations that address reliability but unfortunately add cost. Even if the system is at your own house, you don't want callbacks. 1. A cast iron pump, while much cheaper than a bronze or SS pump, will typically fail in about two years in an open system like this. The need for expensive pumps is drainback's largest cost penalty. 2. Both pumps use siphon loop "u-tubes" on their suction side. We found these problematic because there's so much dissolved air present in a system like this. We had lots of these siphon loops "air lock" eventually, so we began using bulkhead fittings. The u-tubes also complicate the lid design, operation, and fabrication. 3. With radiant floor distribution like this, you should be able to use water as cold as 75F and still deliver heat to the home. The 90F setpoint is more common with fan coils. If you try to use water less than 90F with a fan coil, the air will seem cold. 4. An ongoing maintenance issue is topping off the water level in the tank. No matter how well the tank top is sealed, vapor escapes, which drops the water level. I think this is a near deal killer for most non-DIY applications. The average homeowner will forget to top off the water level and that causes the distribution pump to run dry and fail. 5. 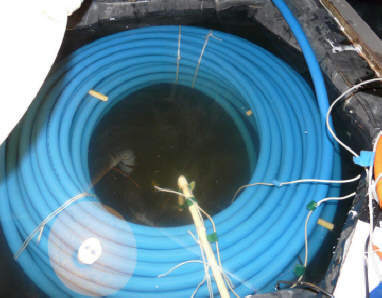 A tank overflow pipe should be provided and piped to a drain. This prevents someone accidentally overfilling the tank which could eliminate the air gap. 6. A strategically placed flowmeter does work great as a water level gauge. If it tends to block the drainback action, crimp the guide rod to keep the float higher. 7. The air gap as you show it is noisy. The return pipe can go below the the tank water level. A 1/4" air hole is drilled in the side of this pipe above the allowable water level to restore the drainback action. Adding a 90 deg. elbow just under the water level will help the tank thermal stratification by reducing the vertical mixing action. I could easily set up a little test with some exposed PEX. 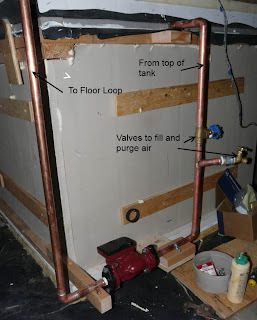 I was thinking about this a bit while on vacation, and one thought was that if you could use selective insulation to make the thing freeze from the center out (eg, risers, manifolds, supply pipes) then the ice should always have free water to expand to. I've had good life with the cast iron pumps. My house came with one that operated as a hot water recirculation system, so not only open, but new water all the time. When I took it out it looked fine and had been operating for 9 years -- I've got it in another spot now. I've heard from others who got long life from cast iron pumps. From what I have read, it has to do with the pH of the water -- high pH slows corrosion. There are also water treatments you can buy that are said to protect iron parts -- the people with outdoor wood furnaces use the stuff, but I've not tried it myself. Have had zero trouble with U tubes, but the larger system has a bulkhead fitting, and it has also been trouble free. I've only heard from one person who built the system that had what seemed to be a U tube problem -- seems like on average they are OK. I only changed over to the U tube because it seemed to be what most of the people who put a lot of these systems in use -- seems to me that either methods is OK. I'd like to see what the house looks like. Have been thinking about an actual book that would get some of the solar designs out to a larger (or maybe just different) audience. I have had one PEX split in the field, on a supply line to a hose bib. Here's a link to a good paper on the mechanics of rupturing pipe. "Rupturing won't happen unless there is an ice blockage and a dead end." The rupture only happens where the water is still liquid. That's interesting. Ice itself isn't strong enough to rupture pipe axially, but as the ice plug grows in the pipe, it compresses the liquid in the dead end. Gary, in a drain back system, what prevents the collector/storage tank water from developing growth, odors, mildew or even algae? I would think that the warm water would be a breeding ground for such issues. I would guess that its because the water gets heated to pretty high temps fairly often. It might also have to do with the water itself. It appears that some of the EPDM dissolves in the water. I once accidentally got a little taste of it, and its really awfully -- kind of a rubbery bitter taste. Maybe this discourages growth. The pH is typically pretty high and I would guess the oxygen level is low -- maybe not a good environment of growth. Not sure exactly what does it, but the water in my two tanks is still clear -- definitely not growing any significant amount of algae. They do sell stuff that you can add to the water if it were to be a problem. One flavor of it is the stuff they use in swimming pools to knock of algae. I've never added anything to my tanks. Of course, none of the water in the storage tank mixes with the potable water.